A bee comforted me very much this morning concerning the desultoriness that troubles me in our work. There seems so infinitely much to be done that nothing gets done thoroughly. We seem only to touch souls & leave them. And that was what the bee was doing, figuratively speaking. He was hovering among some blackberry sprays, just touching the flowers here & there in a very tentative way, yet all unconsciously, life - life - life - was left behind at every touch, as the miracle-working pollen grains were transferred to the place where they could set the unseen spring working. 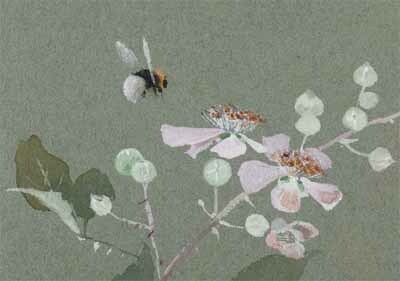 We have only to see to it that we are surcharged, like the bees, with potential life. It is God and His eternity that will do the work - yet He needs His wandering, desultory bees! The first golden crocuses are in from the garden. What is it that makes the crocus and wild tulip form go to one's heart and wake such joy there? It must be something in the flame form... we speak of the God of love, the God of peace, so seldom of the God of joy, that one thing that every opening flower tells of; that joy unmarred by the fall... God the gladness of my joy... anointed with oil of gladness above thy fellows. The flowers are my teachers. I have been watching with great interest the different expressions of flowers as they die. The beautiful worldly, barren things like the white rose and the magnolia put on a look of fading self-pity as they droop, clinging to their stalks to the last. But the little wild flowers keep happy faces wide open till the petals are ready to drop, and then they fold the hands of the calyx over the growing treasure of the seed vessel, which was the whole purpose of their being; life lived for the seen and life lived for the unseen is written all over them. 'Open flowers!' They are the last but one in the list of the temple carvings; (1 Kings 6:29) patience, fearlessness, purity, fruitfulness and the passion for service - we have seen them all symbolised... open flowers surely speak of the joy that is to run through it all... We speak so often of the God of love and the God of peace - so seldom of the God of joy; just that one thing that the open flowers speak of. 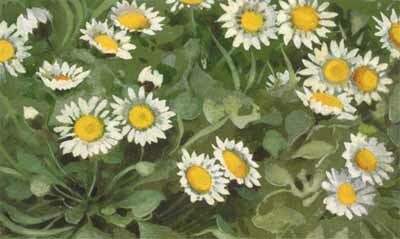 The daisies have been talking today. I see the reason why they spread out their leaves flat on the ground. It is to hold back from the flowers the blades of grass that would shut out the sunlight. They speak of the need of deliberately holding back everything that would crowd our souls and stifle God's light and air. In the life of Jesus there were many times of pressure but they only forced him back upon God, as on the day when the crowds followed him to the desert and he went up to the mountain to drink in, through the long-delayed stillness, such a fresh draught of life as carried him over the rough sea before dawn.